His law firm, Jeremy Trapp, Attorney at Law, provides responsive, comprehensive legal services dedicated to protecting the rights of a variety of clients. Jeremy Trapp is a 2003 graduate of the Thomas M. Cooley Law School, and a 2000 graduate of Cumberland University. He gained admission to the Tennessee State Bar in 2004. Mr. Trapp is also a Smithville, Tennessee, native, and a graduate of DeKalb County High School, where he played baseball. 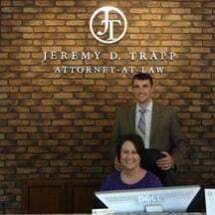 The law firm of Jeremy Trapp, Attorney at Law, is ready to provide powerful representation for people in Smithville, Tennessee, and the surrounding areas.